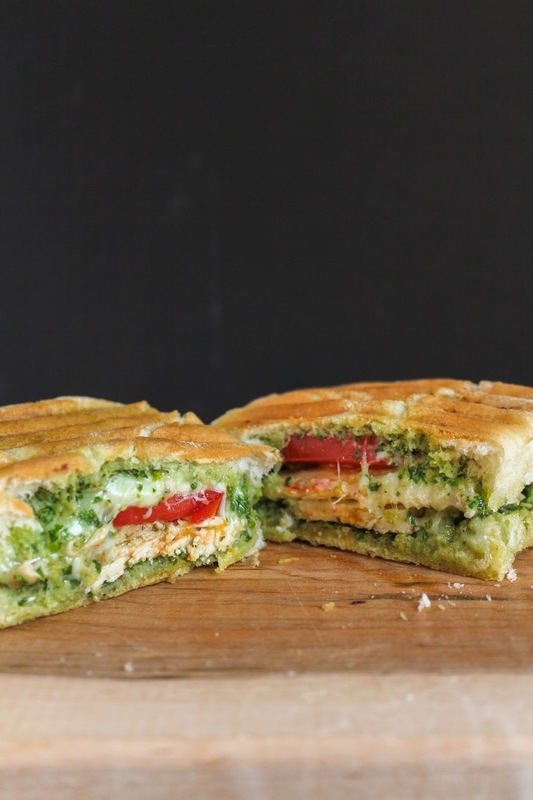 to create the most mouthwatering panini! Quite awhile ago I teased you all on social media with a delicious kale walnut pesto that I made. It was probably a good four weeks ago or so, and I had promised to share the recipe soon. So yeah, a month has passed and I'm FINALLY getting around to posting it! I'm not sure what happened and how all that time slipped by, so I hope you'll forgive me. 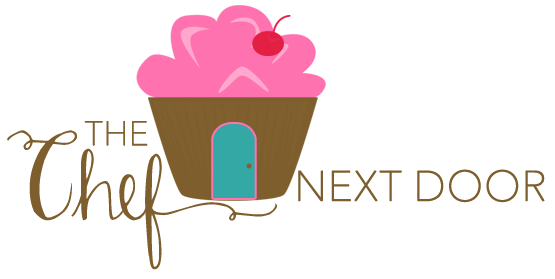 Luckily the recipe is well worth the wait, so there's that. 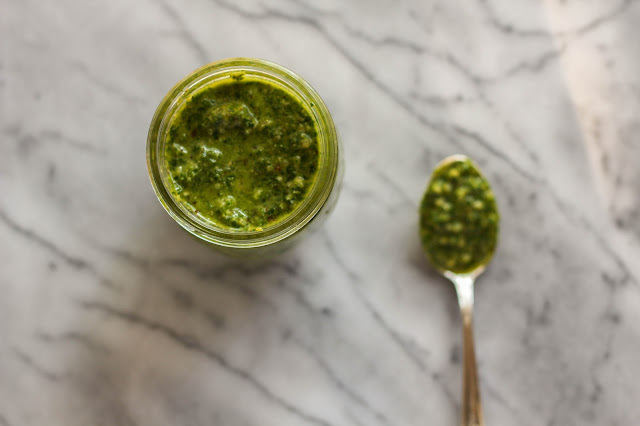 This pesto is seriously the best stuff I've ever had. I love kale anyway, but when you transform it into a pesto, it just pops. Combined with Parmesan cheese, lemon, garlic and crunchy walnuts, I just really can't even describe it. I insist you try it yourself! 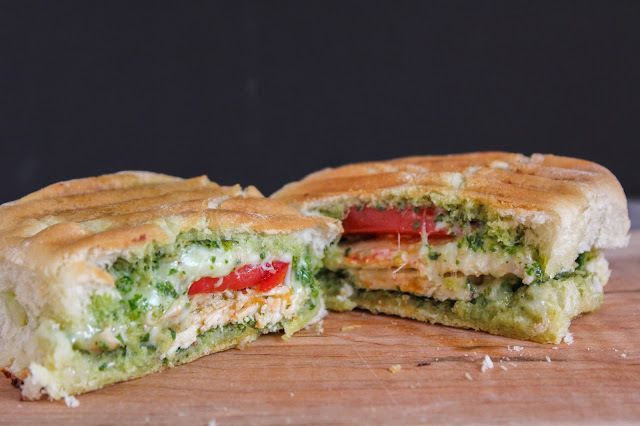 You can use this pesto in many ways, but I decided to put my new Cuisinart Griddler Deluxe to work and make a Grilled Chicken & Kale Walnut Pesto Panini. This Griddler is amazing...you can use it to grill chicken, burgers, even sear steaks. You can also make quesadillas, pancakes and pizza! It's so versatile, and is perfect for indoor grilling. I used the griddler first to cook my chicken breasts. I pounded the chicken thin, seasoned them with salt and pepper, then popped them on the grill. You close the top down on the chicken and the griddler does all the work for you. 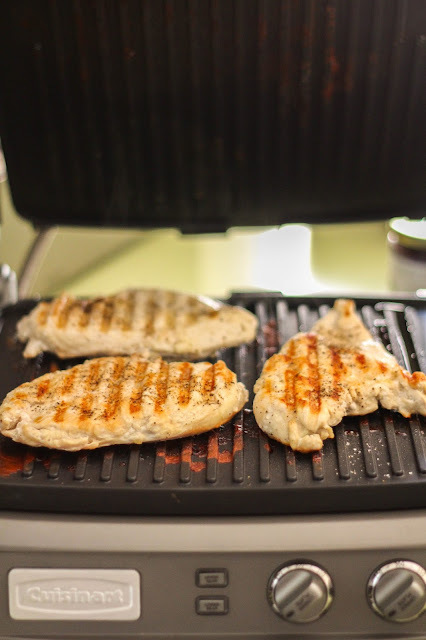 No flipping or turning, in less than 10 minutes you have perfectly grilled chicken! Once the chicken was cooked I let the griddler cool down a few minutes before I wiped it clean and got it ready to make my panini sandwiches. I love that one tool is all I needed to make a meal. And as you can see, it was ooey, gooey, cheesy and delicious! To make the panini, first grill the chicken. Once it's been pounded to an even thickness, sprinkle both sides of the chicken with salt and pepper. If using the Cuisinart Griddler Deluxe, preheat to 400 degrees. Lay the chicken on the griddler, close the lid and cook for about 9 minutes. Allow the chicken to cool for 5 minute or so before slicing. Let the griddler cool down for a few minutes, then wipe it clean with a clean dish towel. Preheat again to 400 degrees. Slice open the ciabatta buns and spread the insides evenly with the pesto. Layer slices of chicken on all four of the bottom buns, followed by two tomato slices, and a nice handful of the mozzarella cheese. Place the top bun on each sandwich. Drizzle a little olive oil on the top of each bun. Place the sandwiches on the griddler and close the lid. Cook for 5 minutes, until the bun is golden brown and the cheese is melted. Halve each sandwich and serve immediately. Disclaimer: Cuisinart sent me a complimentary Griddler Deluxe for my review. All opinions, as always, are my own.